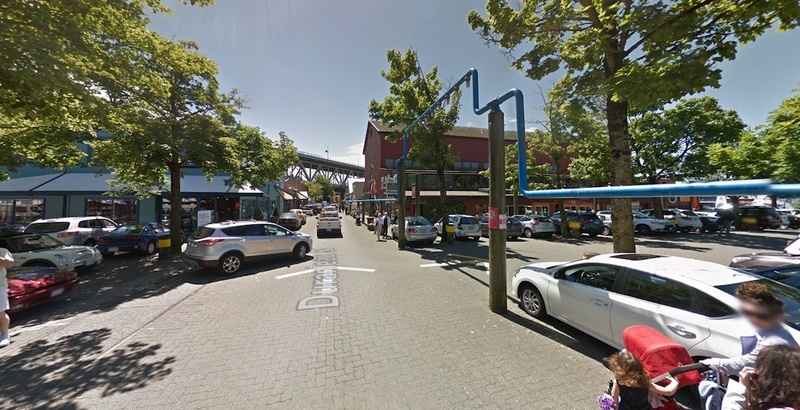 A new survey has found that most Metro Vancouver residents would visit Granville Island more often if it were easier to find a parking spot. According to the Research Co. survey, 61% said more plentiful parking would make the arts and cultural hub more accessible to them, and 58% disagree with the idea of making all parking spaces on the island metered. This comes as Canada Mortgage Housing Corporation (CMHC), the federal crown corporation that owns and manages Granville Island, is planning to implement pay parking across the island from 11 am to 6 pm starting on June 1, 2019. Rates will be $3 per hour during the busier summer months, and $2 per hour during the off-peak months. Currently, Granville Island has over 1,200 parking stalls, with three-hour free or pay parking accounting for about 75% of all parking stalls. The remaining stalls are for reserved parking, one-hour free parking, handicap parking, and other uses. CMHC claims pay parking is needed to help reduce traffic congestion, as drivers often circle the island looking for a free parking spot, especially during the peak periods. The survey also found that residents in the region are evenly split on whether the island should be turned into a pedestrian-only zone that bans the entry of personal vehicles, with 44% agreeing to the idea and 47% disagreeing. “Residents of the City of Vancouver are decidedly more likely to support the notion of a car-free Granville Island,” said Mario Canseco, President of Research Co., in a statement. “But more than three-in-five of those who live in Surrey and other Metro Vancouver municipalities say they would actually make the trip to Granville Island more often if it were easier to find a place to park their vehicles. When it comes to the frequency of visits, 22% of respondents said they have gone to the island six times or more over the past two years, while 42% have visited two to five times. As well, 22% said they visited the island to shop at the Granville Island Public Market, 25% went sightseeing, 17% went for a meal or snack, 16% went for an arts and culture performance, and 5% went to shop at a store outside the Public Market. The parking changes are part of CMHC’s long-term revitalization plans for the island, which could include a Public Market expansion, elevator and observation tower attraction to the Granville Bridge deck, new performance theatres, repurposing the old Emily Carr University campus, and the conversion of many ground-level parking lots into public spaces. It also wants the City of Vancouver to move forward with its Arbutus Corridor and False Creek streetcar plans as a way to greatly improve the island’s accessibility.